RIO DE JANEIRO, Jul 22 2011 (IPS) - Community organisations say the major infrastructure works for the 2014 football World Cup and 2016 Olympic Games in Brazil do not reflect the spirit of the social legacy promised by the government and business community, which project 68 billion dollars in economic benefits from the first event alone. “We have to think about the social legacy for the entire population, and not just part of society,” community organiser Erika Rocha told IPS. Several social organisations created the national “World Cup and Olympics People’s Committee”, to which Rocha belongs, to exercise oversight over the infrastructure works for the mega-events and defend poor families who have been evicted to make room for stadiums, roads and other infrastructure. “We want information and guarantees of participation in the projects,” said Rocha, a community organiser from one of the 750 favelas or shanty towns which are home to 1.5 million of the six million people in Rio proper (Greater Rio has a population of 11 million). “We want to know ahead of time where we are to be resettled, and we want the right to prior, fair indemnification,” said Rocha. Amnesty International has denounced compulsory evictions of poor families squatting on land designated for infrastructure for the sports events. Rocha complained that the public does not have access to information about the infrastructure and transportation projects, which makes it difficult to establish the number of people to be evicted in the different neighbourhood. But the People’s Committee estimates that some 20,000 families will be affected by public works like stadium construction, highways and the upgrading of the port. 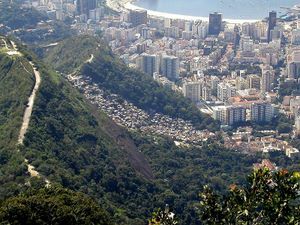 In a hearing before the attorney general’s office of the state of Rio de Janeiro, the affected families mentioned the problems caused by the construction of the Transoeste highway, an expressway that will link neighbourhoods in the western zone of Rio, and the Transcarioca, which will link the north zone of the city to the international airport on the west side. According to Rocha and other critics, the major engineering projects will only benefit a few neighbourhoods, companies and social groups, and not the majority of the population. The community organiser argues that what the people of Rio need are efficient mass transit systems and sports facilities that are accessible to all, especially the poor. Furthermore, “the indemnification payments are ridiculous, too small to allow the favela dwellers to purchase decent housing elsewhere,” Rocha said. She also protested “violence committed by the city government against the communities.” A municipal committee was set up this month to investigate complaints of human rights violations resulting from the evictions and infrastructure works. That is the oft-repeated official line, and numbers are trotted out to support it. The Sports Ministry projects 68 billion dollars in benefits for Brazil from the World Cup, a figure that includes investment in public and private infrastructure works, a rise in consumption, and growth of the services sector. It also estimates that the football championship, including the preparations for it in the 12 host cities, will lead to a rise in tax revenues, generating an additional 29 billion dollars in direct taxes and 10 billion dollars in indirect taxes. In addition, some 600,000 foreign tourists are expected to visit Brazil for the World Cup, bringing the country an additional two billion dollars. And the tournament will create an estimated 332,000 direct and permanent jobs and 381,000 temporary jobs in 2014. “No one would push so hard to host a World Cup or Olympic Games or spend so much money on upgrading if the aim wasn’t the most important thing: leaving a social legacy,” Rio de Janeiro state secretary of sports and tourism Marcia Lins recently told a group of businesspeople. Lins was speaking at one of a series of meetings being held in the state on the World Cup and the Olympics, organised by the Service of Support to Micro and Small Companies (SEBRAE), which has a programme to help this economic sector take advantage of the opportunities offered by the two events. SEBRAE president Luiz Barreto told IPS that this is a great chance for a sector that accounts for 20 percent of GDP and 50 percent of all workers who have a work card – the Carteira de Trabalho e Previdência Social, which affords them full benefits – in this country of 191 million people. And with the growth in industries like civil construction and tourism, “that proportion could grow to 23, 24 or 25 percent of GDP over the next few years,” Barreto said, citing a study by the independent Getulio Vargas Foundation. “We are working hard on relations between the public and private sectors, in terms of both large and small companies, in order to have the best possible World Cup, in and outside the stadiums,” he said. Famous around the globe for his performance in the world’s leading stadiums, former football forward José Roberto Gama de Oliveira, better known as Bebeto, who is now a Rio de Janeiro state deputy or lawmaker for the Democratic Labour Party, also wants to participate in the process. “Deputado Bebeto”, as he is popularly known now, was behind the creation of a state legislative committee to monitor the economic, environmental and social effects of the World Cup, Olympics and 2013 FIFA Confederations Cup, which will also be held in Brazil. “Football was my life,” Bebeto told IPS. “I am very familiar with the difficulties these events will pose,” said the veteran forward, who sported Brazil’s yellow and green jersey in three World Cups and two Olympic Games. “Everyone will have their eyes on Rio de Janeiro and we have to do things right,” he stressed. Bebeto wants to make sure that the transportation system created for the sports events takes into account the real needs of the people of Rio. “Football is in our blood. And now that we will host a World Cup and will be playing in our own country, we have an opportunity to show that we can do things right, not only on the field,” he added. To do this, Rocha said, the priority must be put on transparency in spending, and on incorporating the social dimension. And for this, she argued, Brazil has to learn from experiences like the 2007 Pan American Games, held in Rio. At that time, the city government evicted many local residents from the Canal do Anil favela, with “the argument that the homes were irregular constructions along a river bank,” she recalled. “The Pan American Village was built next to the community, with public funds. Today, those apartments are in ruins, and are uninhabitable,” she said.